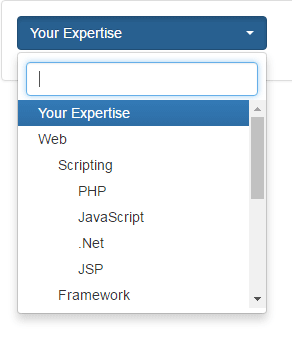 By using the hierarchy-select jQuery plug-in, you may create a dropdown with options in the hierarchy. Normally, the select dropdown displays options in the same order as provided. This plug-in allows presenting the options in a hierarchal way and implemented with Bootstrap framework. You have to use a few data attributes to define the levels. See the demo and code below. How to set up this plug-in? First of all, download the plug-in from the above link and place the hierarchy-select.min.css and hierarchy-select.min.js files in the appropriate locations as per your project directory structure. Refer both files; CSS in the head section while JS file after the jQuery library and before the body closing tag for better performance. See the demo and markup below. In this demo, the dropdown options are created with hierarchy. If you look at the markup by visiting the demo page or below, you can see it is basically the <li> tags that define the options. The <ul> and <li> are contained in a main div with dropdown-menu and open classes. See the output and complete code on the demo page. You can see, the select box also has a search field that will filter the options in the dropdown as you enter the characters. This can be achieved by using the search option in the jQuery code and setting its value as true as used in the demo.